Don’t you wish you had a psychic who could hand-deliver NCLEX-RN answers to you? Well, a highly effective NCLEX study guide with NCLEX RN practice test questions are the next best thing. It’d sure make your life easier. 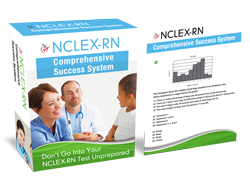 You wouldn’t have to struggle with how to answer NCLEX practice test questions. You wouldn’t have to deal with the pain and misery of yet another failed NCLEX-RN exam score. You wouldn’t have to suffocate under crushing self-doubt as you wonder if you were truly meant to become a registered nurse. Well, we’re here to help – and if you’re ready to show those test questions who’s the boss, we have a single piece of information that will help you do it. By identifying this solo clue, you can learn how to answer NCLEX-RN questions like for Health Promotion and Maintenance, Parenteral-Nutrition, Physiological Integrity Basic-Care And Comfort and Physiological-Integrity-Physiological-Adaptation . Use this technique, and you’ll experience what it’s like to truly acknowledge the fact that you’re ready to become a registered nurse. You’ll start feeling confident, proud and excited for your dream life as a registered nurse. In fact, taking NCLEX practice tests just might become your favorite hobby! Ignore this technique, and you might as well become best friends with the suffering, embarrassment and expense that comes hand in hand with multiple nursing school exams – because you’ll be years away from passing one. So what’s this magical piece of information that can single-handedly show you how to find NCLEX answers – and relieve you of your registered nurse practice woes? Before we get to that, let’s look at the science behind the technique. The people behind the National Council of State Boards of Nursing and Pearsonvue.com don’t actually want to see you fail. They want you to pass your RN HESI tests and become a registered nurse as badly as you do. That’s why they pepper every NCLEX question and answer with at least one clue as to the correct option. Sounds like wishful thinking, but it’s true: recent studies have confirmed that most test questions have a hint to point you down the right direction. Some may be in the form of a word, others in the form of an implication. And when it comes to How To Answer NCLEX Questions, it comes in the form of the client’s age. Take out a practice exam and open to a multiple-choice question. Underline any instances where the question hints to the client’s age. For example, words like “baby”, “child”, “man”, and “woman” should be highlighted. Now look at the NCLEX answers presented. You’ll see multiple choices that contain information on patient care and treatment. Next to each answer, mark down which age group the treatment would be appropriate for (i.e., child, adult, baby, etc.). Now compare the age groups in the NCLEX question and answer. The answer that has the age-appropriate treatment is the correct one. So what’s going to happen when you start putting this technique into good use? …And it’s all because you finally found the ultimate method on how to answer NCLEX questions. Start using this mind set when you approach your NCLEX practice tests in your study guide and on your upcoming testing day.